For about a year now, TimescaleDB has been the most requested feature on Azure PostgreSQL. Today, we are excited to make that request a reality by announcing our partnership with Microsoft Azure to introduce support for TimescaleDB on Azure Database for PostgreSQL. This means current and prospective customers can now deploy fully-managed production-ready instances of TimescaleDB’s open-source offering with just a few clicks on Azure. Why Azure Database for PostgreSQL? At a high-level, Azure Database for PostgreSQL is a managed service that lets you run, manage, and scale highly available PostgreSQL databases in the cloud. It provides flexibility, built-in high availability, the ability to quickly scale, enterprise-grade security, and compliance offerings. We recognize that many of our users are modernizing their existing data infrastructure or building new IoT applications, and many of them want to do this in the cloud. We also recognize that Microsoft Azure is a well respected and widely popular cloud computing platform. But overall, we believe a collaborative attitude is at the heart of open-source. The Microsoft we know today is a strong open-source supporter and open-source partner, so we are excited to be working with Azure PostgreSQL for this offering. TimescaleDB, built on the SQL open standard, unifies time-series, relational, and geo-spatial data in a single database system that scales from the cloud to the edge. While TimescaleDB can be used for a variety of use cases, it has become especially popular with IoT organizations who naturally collect large amounts of time-series data. TimescaleDB solves many challenges that IoT organizations face: e.g., how to easily manipulate time-series data; how to scale for time-series workloads; how to enrich time-series data with metadata, geospatial data, and external data; how to easily operate data infrastructure seamlessly from the cloud to the edge. With TimescaleDB, organizations working with IoT and time-series data can more easily identify the insights hidden in their data to drive efficiencies, monitor operations, and automate processes. At the same time, with TimescaleDB they can develop new IoT applications faster and more reliably, while future-proofing them by building atop the rock-solid reliability of PostgreSQL. To learn more about the benefits TimescaleDB offers for IoT, read here. 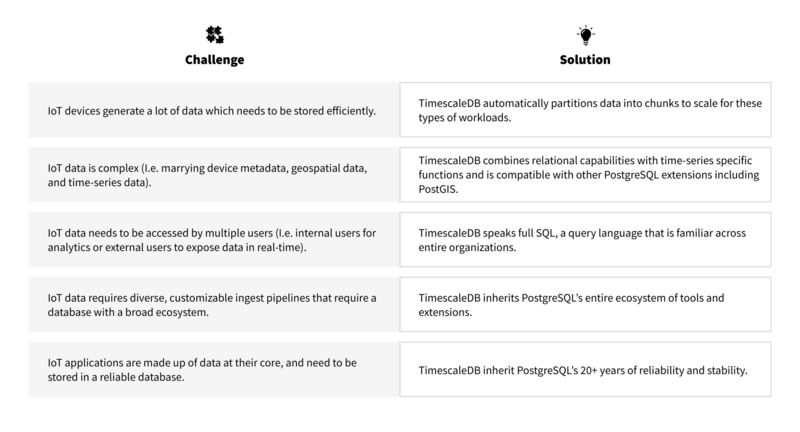 Our engineers built TimescaleDB to be more scalable, faster, and easier to use than vanilla PostgreSQL. 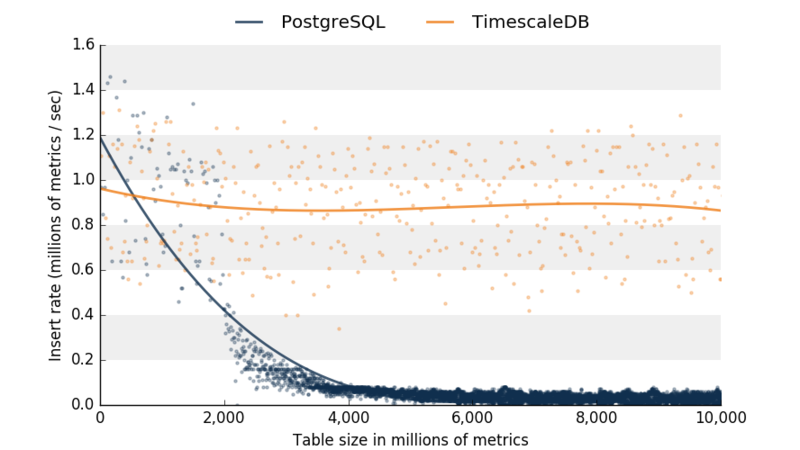 With TimescaleDB, users can scale to billions of rows on PostgreSQL, while maintaining high, constant insert rates. TimescaleDB also includes time-centric functions, making time-series manipulation in SQL even easier, and speeds up query performance. As you can see, insert performance with Azure Database for PostgreSQL degrades over time, while TimescaleDB’s insert performance remains consistent. You can find more information on how to get started with TimescaleDB on Azure Database for PostgreSQL here. If you are new to TimescaleDB, please follow these installation instructions. Note: Azure Database for PostgreSQL only runs the OSS version of TimescaleDB. For more information on the advanced features in the TimescaleDB Community and Enterprise editions, and to better understand the right option for you, please see our feature matrix. We encourage active TimescaleDB users to join our 2,000+ member-strong Slack community and post any questions you may have there. Interested in learning more? Follow us on Twitter or sign up below to receive more posts like this! Today we’re announcing Relational Flux (Reflux), our support of the Flux custom query language for time-series analysis. IoT data is complex and needs to be accessed by multiple users, so don’t make the mistake of creating data silos.